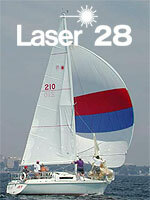 Welcome to the official web site of the Laser 28 International Class Association. Our goal is to be a resource to our members and to offer a community to those that have an interest in the Laser 28. "Racer/Cruiser" - is a worn-out cliché. You can race anything that floats. But, if you want the feel of performance instead of driving a truck, you can knock out 95% of the 28 ft. market. If (heaven forbid!) you also wanted to stand up below and do more than race around the bouys, there go all the rest - but one, the Bruce Farr designed Laser 28. This boat has 5' 10 1/2" standing headroom, sleeps four (or a family of five) in comfort in a double V berth (6 3") and a large converted dinette (6' 7"). There is a full galley, 2 coolers, an enclosed head aft with marine toilet and through-hull and behind it a cavernous walk-in wet locker which you won't find in any other boat this size. A carefully engineered grid system picks up all the keel and rig loads and distributes them out evenly into the fully cored sandwich construction. There is no simpler rig on the market. With its roots in the original Laser Class Association, the Laser 28 International Class Association builds on that foundation to be a resource to all owners and prospective owners. If the ability to cruise in comfort and race hard, all the while being able to have a friendly cocktail with friends is of interest to you - we think you're in the right boat, the Laser 28.